The Official Testers were very well catered for, with age appropriate cake and utensil sizes, crayons, toys and the like to keep them entertained. There are also high chairs available. 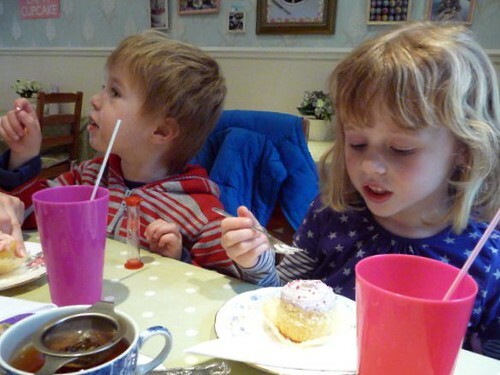 As it was, the children were quite happy to sit up at the table with the grown-ups for most of the time and play with the egg timer which had been given to me, in order to advise when my tea had brewed (a very cute touch). We had booked a table for 1:30 p.m., as I'd been told on telephoning that the shop got very busy on Saturday afternoons. So we were a bit puzzled, when we rocked up, to find that we were the only people in the place. This remained the case for our entire visit. 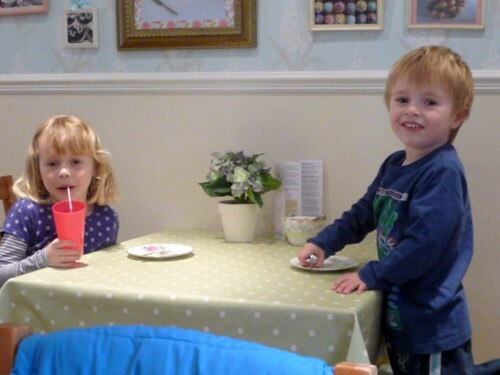 Luckily the children were noisy enough to cover any awkward silences that might have occurred, but I thought it was strange that the shop was so empty, at what I thought would be a peak time for custom. It also made taking photos a bit uncomfortable. I had hoped to get a few shots capturing the atmosphere of the place; a bit of a challenge when you are the only customers, hence the rather huddled nature of those contained herein. Lucy took a standard chocolate cupcake, which was as good as the chocolate & hazelnut one I'd had before. The children both had a vanilla fairy cake. They were very moist, mainly due to the sugar syrup which had been brushed on top of the cakes. But not much of a vanilla taste came through on eating the cake. The frosting was a tad on the buttery side for me, but it was received well enough by the testers. I plumped for an Oreo cupcake, which was that day's special. Hmm. 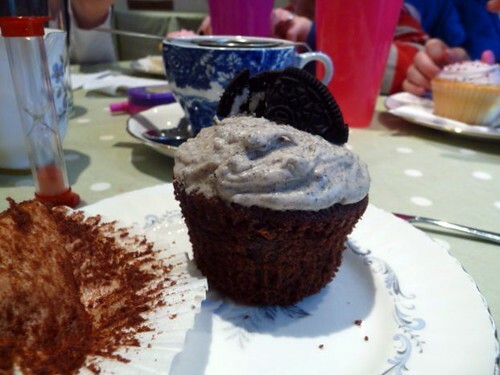 The grey frosting was offputting and the Oreo decoration had gone soft (Tip: don't top off Oreo cupcakes until the last minute and fold the crumbs into the frosting, don't stir or beat them in, to avoid grey frosting!). The cupcake was perfectly pleasant (we presumed that it was the same recipe used for the chocolate cupcake), but my usual benchmark for food is that the more noise I make while eating it, the better it is. I was fairly quiet while eating this cupcake. The cakes are keenly priced. Lucy ended up paying, so I can't remember exactly how much they were (remind me to pay you back, Lucy! ), but I think they were in the region of £2. In all, we had a nice afternoon, the service was good, the children enjoyed themselves and we didn't feel as though our purses had been ravaged. The big disappointment, which was shared by Lucy and me, was the lack of choice; an issue which lots of the cupcake bakeries seem to share. The shop is quite small at the front, so perhaps this explains the limited flavours on offer. But the shop's website lists lots of flavours, some of which we were really hoping to share and try. There was only one 'special' cupcake flavour and one large cake on offer, alongside the standard vanilla and chocolate cupcakes; there wasn't even a sniff of the overrated red velvet, which most places seem to now have as a standard. No biscuits or cookies were being sold at the time of our visit. If I had a friend visiting and wanted somewhere to while away an hour or so, I'd return to Sweetie Pies. But I can't see myself becoming a regular visitor until the choice becomes a little more inspiring. 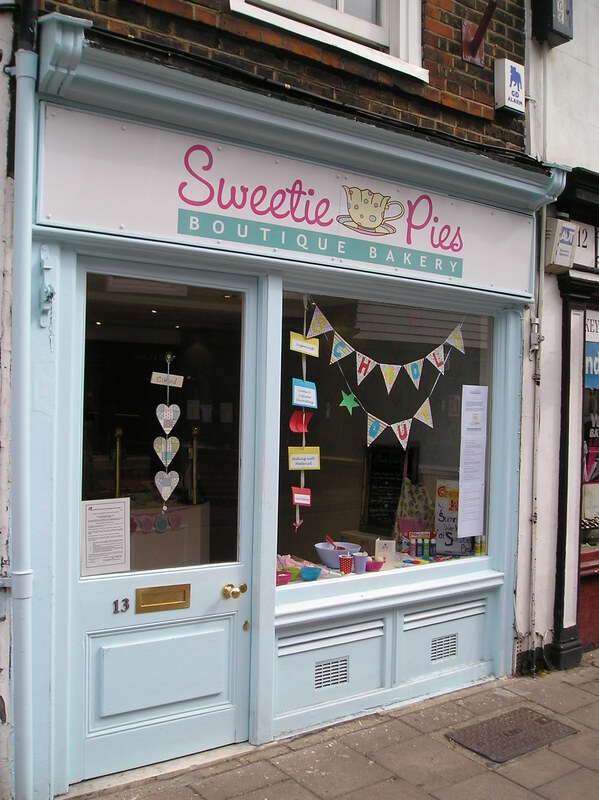 Sweetie Pies Boutique Bakery is at 13 Church Street, Twickenham TW1 3NJ. Opening times: Tuesday to Friday, 10 a.m. to 5 p.m., Sunday 11 a.m. to 5 p.m., Closed Mondays. In closing: a giveaway! 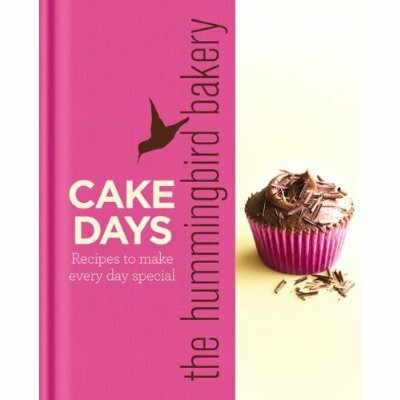 I have a spare copy of the Hummingbird Bakery's new book, 'Cake Days' to give to a UK-based reader (sorry, I can't afford to post this internationally). I haven't delved into this book yet, but where the first Hummingbird book gave the recipes for the cakes they sold in their shops, this one gives an array of recipes for special occasions. To win, tell me in the comments section below what your fantasy cupcake flavour is. The more imaginative, the better; whether it be sweet, savoury, based on your favourite childhood sweet: anything goes. For a second chance to win, follow this blog via Google Connect and leave a comment saying that you have done so. Crazy flavours are my specialty! Think Maltese prickly pear, finnish salty liqourice, bubblegum and more. I'd love a candy floss cupcake or cherry cola. Oh yes, that has to be it. Cherry cola cupcakes! My fav sweets as a nipper were rainbow drops and flying saucers! Maybe a multi coloured cupcake with sherbert in the middle so it explodes in your mouth all topped of with some sprinklings of rainbow drops on top.....sugar hit or what!